I read the change-log in its entirety and that took a goodly amount of time. So, if one imagines the duration of hours that must have been invested to implement each individual change it is indeed easy to determine how massive an undertaking this actually was. Such labor has gone without pay but it shall not abide without our sincerest gratitude, awe, and appreciation. I propose that this, the most extraordinary Community Patch Team, be awarded and issued forthwith, the Order of Merit. Huzzah! Does that mean you'll be finally running it?! Check the properties for the files sacred2.exe and s2gs.exe, go to the compatibility tab and check if the option to run as administrator is checked. If it's not then please check it on both files. So do I have to uninstall CM 150 before installing 160 or does it just update it? Installing CM 160 should update the current version unless you have added mods. If so, doing a clean install, rather than deleting any mods, may work better, as the installer looks for the pristine installed game with no modifications other than the CM 150 Patch. If you get an error message you may report it here. I'm going to do a clean installation then. Thank you very much Hooyaah. Grats on reaching Release Status! I have yet to even play/test the last update. - High Elf's graphics have some glitch around the neck, look at the attached image. - Since previous patch 1.50, if you have Bargaining skill it's really easy to find double handed Swordstaff Lightsabers at the merchants, but the possibility to find a single hand Lightsaber seems close to zero. Has anyone else notice the thing? 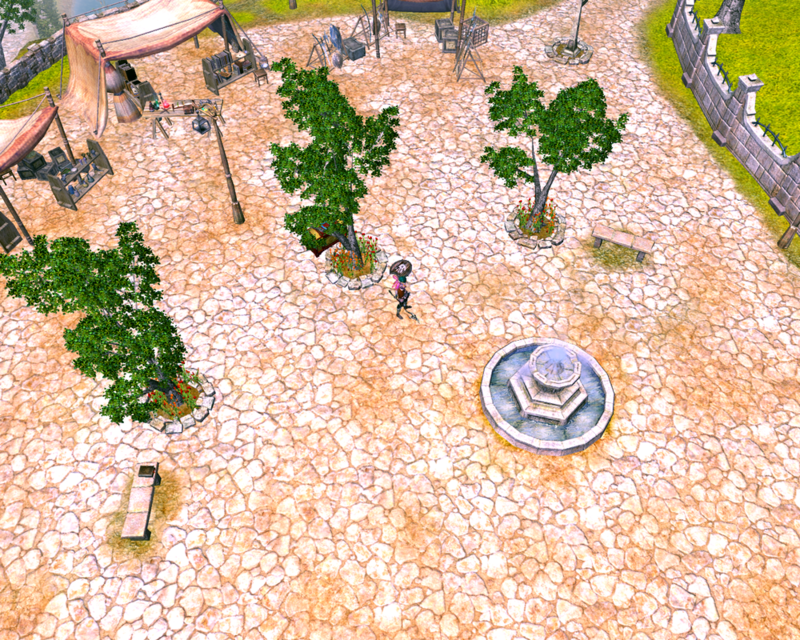 - After teleporting to Sloeford from the initial island using the small portal, the city appears empty, without npc for some seconds (see attached image). Thank you and sorry for my broken english. Autumnblaze, welcome to the fora here at DarkMatters! There was an issue with an updated GR2 file that caused it to be reverted to a "fixed" version. Please let us know if you still see the line in question. If you change the hairstyle it may correct the problem but I had noticed that similar gaps in the skin coverage have occurred with other set pieces. To resolve the issues each set piece and hairstyle would have to be corrected. It's a huge undertaking but I believe that there is an older GR2 that might resolve the issue we see above but there are other issues with that file as well and that's why it was replaced. Autumnblaze, welcome to the fora here at DarkMatters! There was an issue with an updated DR2 file that caused it to be reverted to a "fixed" version. Please let us know if you still see the line in question. If you change the hairstyle it may correct the problem but I had noticed that similar gaps in the skin coverage have occurred with other set pieces. To resolve the issues each set piece and hairstyle would have to be corrected. It's a huge undertaking but I believe that there is an older GR2 that might resolve the issue we see above but there are other issues with that file as well and that's why it was replaced. We've implemented yet another fix since Autumblaze's pictures, that is currently available in the CM 1.60 that is released. We tested and the seams are gone. Indeed, there is no "new" or altered High Elf base model of any kind in the current CM Patch 1.60. The vanilla, unchanged High Elf model is used to ensure perfection (or close to as possible), and instead the troublesome set pieces were edited. Time consuming indeed, but Dmitriy was up to the task. Thank you very much for keeping this game updated. I wanted to know before installing the cmpatch1.60 if I still should add the -nocpubinding and -skipopenal and if there is anything else to do to avoid crashes. And if you still want the PhysX effects, before installing cm 0160, back-up the file physxext.zip in ...\Sacred 2 Gold\pak, then install 0160 and then reput the file where it was, replacing the new one (make a back-up of the 0160 file which is 10ko if you want first). And check "Execute as admin" too in the Sacred 2 shortcut properties. PhysX effects from spells are still present, its just that the leaves, branches, stones, other persistent litter are gone. I would've kept them, but finding out, that, while on ground, they constantly oscillate up/down(up close it looks like a swarm of bugs) was a final straw. There was one user who meant to keep the flying leaves and he reported no crashes with the original physxExt though, so if someone's willing to do the same it's good advice. PS: It was probably you Desm, ha ha. ahahah yes maybe, I don't remember. That's a very good question Wattouat and we never got a reply, did we? If so I couldn't find it. Perhaps one of the Patch Team will respond soon. That's a very good question Wattouat and we never got a reply, did we? Guess, the original reply's got lost in a passage of time. -nocpubinding - allows the sacred2.exe process to utilize multiple CPU cores, which should improve both speed and stability, at least in theory. -skipopenal - disables calls to the game's heretical hardware 3D sound solution, based on OpenAL(Known to cause CTDs from time to time). Closing this thread as the mod is no longer in beta status.